My mom never intended to homeschool. She was a teacher and my dad was a college profesor. After my brother reached school age, the plan was to send him to the school where she worked. The problem was, because of her experience in the classroom, she knew how school would go for my older brother. She anticipated the notes that would inevitably come home with him about how he couldn’t sit still. So when homeschooling was not a very popular choice, my parents decided (with no small amount of fear) that it would be the best option for my brother. I’m so glad they did. I have a learning disability, a visual perceptual processing disorder. Little did my parents know that when they chose to homeschool on my brother’s behalf, it would be a very pivotal decision that would greatly affect my life as well. Am I capable of homeschooling? Parents have been wondering since the beginning of this movement whether or not they were capable teachers who could adequately prepare their children for the future. 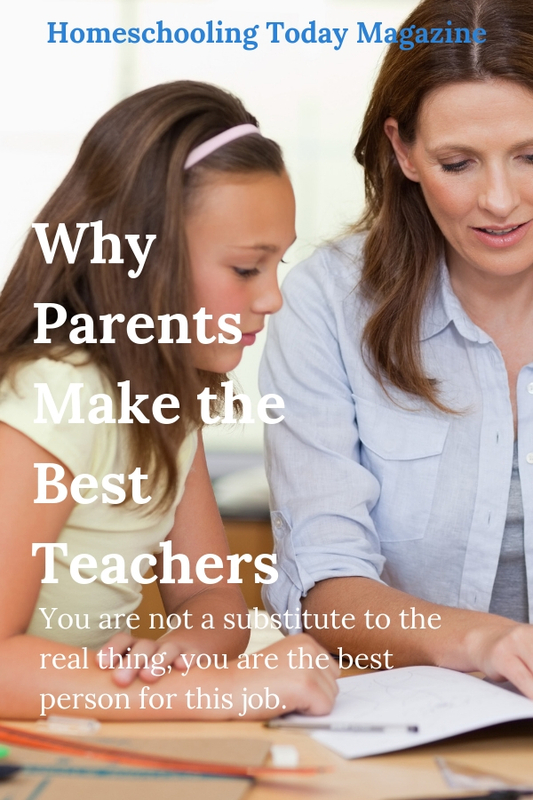 I think what made my mom’s message so valuable to other parents was that she knew what was happening in the classroom and why parents made the best teachers. No one is more invested in your child’s future than you are. No one knows them better than you do. No one loves them more than you. You are not a substitute to the real thing, you are the best person for this job. Those with an educational background play a vital role in helping us understand how children develop and providing curriculum we can use to teach our children. However, everything that an expert offers must be filtered through the knowledge you already have about your children. What motivates them? How do they learn best? When are they most productive? So take heart dear mom who still wonders if she’s the best one for the job. You are. You are because you can see through a bad attitude in a moment. You can take the time to address a character issue that rises up and is more important than the lesson being taught. You are the one who provides a safe place to learn and grow. I will never forget the moments we shared as a homeschool family. There were times of struggle yes, but there were many more times of great joy mixed with the thrill of learning something new together. The role of a mother never ends. It changes and adapts to new seasons, but you will never stop being mom. That is the single greatest thing about homeschooling. You get to do both. You get to learn together and you get to enjoy the small moments of life in between. Not all of the moments will be enjoyable of course. There will be failed experiments, there will be burnt dinners, sibling squabbles and socks on the floor. But when you look back, you’ll see that all those little moments of teaching, settling arguments, picking up socks and learning alongside your child, add up to a treasury of sacred memories. Don’t give up your role for a lesser one. Don’t be just the teacher, be the homeschool mom! Currently, Ashley is the Editor-in-Chief of Homeschooling Today magazine, Public Relations Director for Geography Matters and the author of the Profiles from History series. Ashley makes her home in Somerset, KY, with her loving husband, Alex, and their precious son, Lincoln.